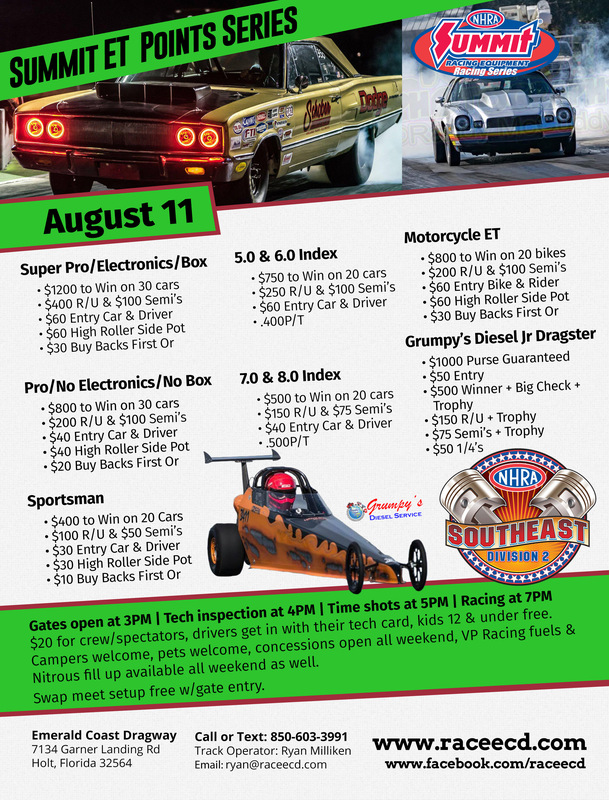 NHRA Summit ET Series returns to Emerald Coast Dragway on Saturday August 11th! Get your series points in and jump in an index class or two for double to triple the chances at taking home some money! All classes (except Grumpys Diesel JR Dragster!) are 100% payback, more cars = more money! Multi classing and double entering ok, we’ll do our best to accommodate but ultimate it’s up to the drivers to make the call to the lanes! Gates open 3PM Saturday, tech inspection at 4PM, time shots at 5PM & racing to begin immediately following opening ceremonies at 7PM. $20 at the gate for crew/spectators, kids 12 & under free, drivers get in with their tech cards. Those of you looking for test & tune, we’d like to encourage you to get in a class that you most closely fit in, if that doesn’t work get a hold of us and we’ll do our best to accommodate.